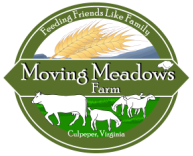 "I have been a loyal Moving Meadows customer for two years. They have the best homemade breads, made with freshly ground flour. Their grass fed beef and goat is the best I have ever had. The pasture raised chickens and turkeys are much better than any you could buy in a chain super market.